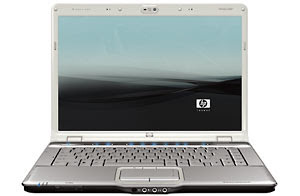 The HP Pavilion dv6700t is the latest 15 incher laptop from HP. Because of its screen size and weight, the HP Pavilion dv6700t is not geared for those looking for a mobile companion but more of a desktop replacement. The HP dv6700t has a more solid built and the large 15.4 inch Brightview display with 1280 x 800 pixel resolution that makes it great for watching Blu-ray on the go, that is, if you opt for the Blu-ray drive. I forgot to mention that the HP dv6700t Special Edition Notebook PC is highly customizable and starts at $699.99 with their base configuration. The dv6700t weighs around 6 pounds so it would be hard lugging this thing around. Aside from its large screen, you can customize the HP dv6700t Special Edition notebook to suit your needs. You can opt for the Intel Core 2 Duo T5750 2.0 GHz processor if you want to keep things simple or you can go as high up as the Intel Core 2 Duo T9300 2.5 GHz processor if you want more out of the dv6700t. Other configurable options includes the memory which can be upgraded up to 4GB DDR2, the graphics card which is a choice between the Intel Graphics Media Accelerator X3100 or the 256MB NVIDIA GeForce 8400M GS, network cards, hard disk drive, and a standard DVD writer or Blu-ray ROM. I highly recommend going with the NVIDIA graphics card if you’re going to get the Blu-ray drive in order to maximize and squeeze the portable HD media center of the HP dv6700t. However, if you already have an HDTV in your home, just hook up the dv6700t via HDMI since the screen doesn’t do much justice for Blu-ray movies. Performance wise, the HP dv6700t delivers fast processing power and good audio quality thanks to the built-in Altec Lansing Speakers. However, the dv6700t can get pretty hot when it’s been used for prolonged periods so I suggest buying a portable notebook cooler. Another advantage of the HP dv6700t Special Edition Notebook over other 15 inch notebooks is the expansion slot on the side. Other notebooks don’t offer much expansion slots so if you’re a USB freak, you can still upgrade the 3 USB ports on the notebook. The HP dv6700t is another winner from HP. Not only does it have the option for a Blu-ray drive, it also has a built-in HDMI which you can rarely see on a $699.99 notebook. Plus, you can chop off $150 off on the price plus free shipping if you find the right HP online coupons.